Capacity 740 cc / 45 cub. in. Frame Double-downtube frame with engine as a stressed member; box-section aluminum monolever swing arm. Rear Suspension Monolever swinging arm. Rear Wheel Travel 114mm / 4.5 in. Length: 2220 mm / 87.4 in. Width: 900 mm / 35.4 in. Height: 1300 mm / 51.2 in. Wheel Base 1516 mm / 59.7 in. The most serious challenge to Europe's most successful indigenous four hails from the heart of the Fatherland. BMW's new K75 triple is so smooth, so quick, so crisp and light, it makes us ask: What's a K100 to do? Times change, but the separation of things German still remains. Study the case of BMW's latest addition, the K75C, a triple in a time of twins, an inline engine flopped on its side in a time of V's, a bike with an automotive-styled power-plant in a time when other machines wear cosmetic fins. The K-bikes, like their opposed-twin forerunners, offer novel, eccentric answers to common problems—they use fuel injection when few motorcycles dream of such stuff; they have a long history of shaft drive; sport monoshock, monolever rear suspension, aluminum fuel tanks, a peculiar engine configuration. And now we have the rational eccentricity of the triple K75. Don't fall into the trap of thinking the K75 just a K100 with one cylinder lopped off. 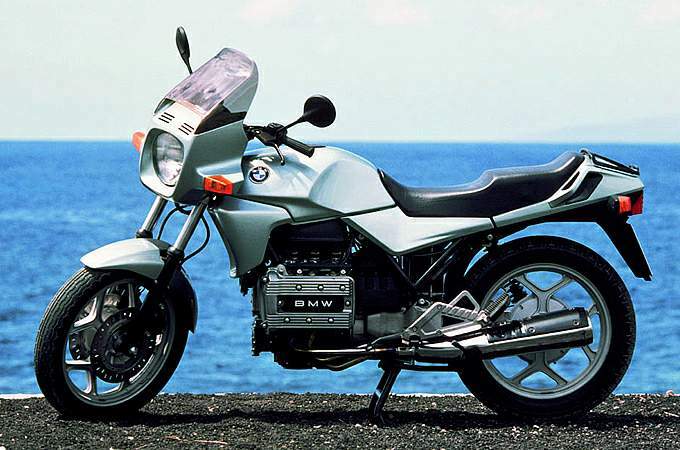 Yes, the two bikes do share a lot of parts; BMW originally planned a 50-percent exchange rate, but, since K100 bits have gradually shifted over to K75 spec, the company now claims 60 percent. The "building-brick" principle of the K75 as the next logical step in K100 technology goes something like this: The designers will tell you the bikes differ only in the disappearance of one cylinder and the re-bending of the frame's front downtubes. But ask them about the K75's combustion chambers: "A little different," comes the answer. And the ignition curve? "A little different." Suspension front and rear? "A little different." Fuel delivery? "Also different, ein bisschen." Clearly the 75 is its own motorcycle—even a ride around the block tells that story. In case you've forgotten how unique the K-bikes really are, let's review some engineering details. A longitudinal crankshaft transmits power to a second engine output shaft lying parallel to the crank. The last web of the crank, cut as a helical-toothed gear, meshes with the clutch drive and attached output shaft, while the nose of the crank drives two overhead cams via a roller chain and also controls ignition-pulse duties. The front of the output shaft drives the oil pump and the water pump. Spinning at crankshaft speed but in the opposite direction, the output shaft cancels any torque reaction. Bosch LE\Jetronic fuel injection feeds each cylinder at its intake port. Overrev protection comes at 8777 rpm in the form of an ignition retard and at 8905 rpm when the fuel injection cuts out. The engine and transmission/monolever rear suspension bolt together to form BMW's patented Compact Drive System, and a space frame bolts to this to carry the steering head and upper shock mount. That's about it. Now let's talk numbers: BMW claims the K75 weighs 24 pounds less than the K100 dry, and fuel capacity stretches the weight difference to 59 pounds wet. Just as significant as the actual pounds is their distribution: The 1000cc bikes carry 34 percent of their unladen weight on the front wheel, the 750 33 percent. Remembering the K75's weight loss, its front end is in charge of 165 pounds and the K100's 190 pounds. Out on the road, this weight redistribution makes a phenomenal difference. The rider's perception of overall trimness is such that unknowing riders jumping off a K100 and onto a K75 might think they'd also jumped out of 100 pounds or more. 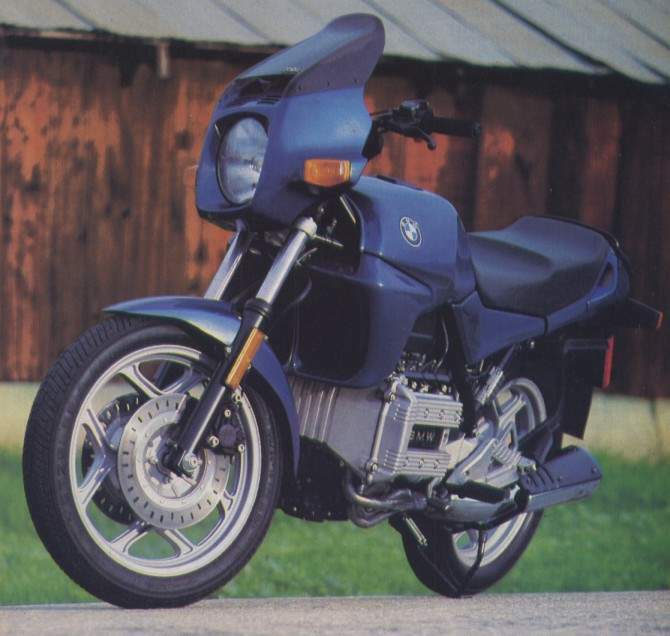 Indeed, weight loss and redistribution were claimed to be the key factors in BMW's decision to make the K75 a triple and not just a short-stroke K100. Although shortening the 100's stroke would have raised the redline and cost less than developing the triple, BMW estimates it would have saved only a pound of mass. But triples shake, at least traditionally they have, and some have shaken fiercely. Inside the K75, however, BMW provides a good measure of counterbalancing force for the 120-degree crankshaft, while adding a minimum of complexity. It's a deft little piece of engineering; instead of creating a whole new counterbalancing shaft, finding room for it inside t the case and power to drive it, a la Porsche, Ninja, etc., BMW engineers hit upon the existing secondary jackshaft, bare in the K100, and attached a pair of counterbalancing weights directly to it. It's a way of combining two inherent characteristics of the K75 engine to cancel each other out, and it works very well. We were impressed with the smoothness of the preproduction K75s we rode in Germany last summer, and we remain so with our test unit here in California. The K75 feels smoother than the K100 at virtually all rpm. BMW engineers took other steps to smooth power pulses. The K75 made mincemeat out of the driveline damping system used in the K100 series. The four-cylinder has dampers mounted in its drive shaft to output-shaft/clutch connection to soak up the pounding of power pulses. With the triple, fewer firing impulses per crankshaft revolution made for more jolting power delivery to the gearbox. To cope with this, the K75 employs a damperless system and a clutch modified from an R80 boxer twin. Although the K75 closely resembles the four-cylinder K100 in general layout and concept, making the triple design work necessitated significant changes. First the crankshaft, set with its rod journals at 120-degree intervals, delivers one firing impulse for every 240 degrees of crank rotation. The crank's 70.0mm stroke pulls 67.0mm pistons through an undersquare cylinder configuration measuring the same as the K100's, but the pistons themselves are not the flat-crowned slugs of the 1000cc bike; rather they have slightly domed crowns with two valve-relief pockets to boost the 750's compression ratio up to 11:1 from the K100's 10.2:1. Give some thought to these compression numbers. The 750 CR king is Yamaha's FZ, running 11.2:1 figures; Suzuki's GSX-R has 10.6:1 pots. These bikes have complex four- and five-valve heads, along with sophisticated combustion-chamber design—both BMW's K-bikes use two-valve heads. K100 combustion chambers also have a prominent squish band, a design feature completely eliminated on the 750. Yet our K75 never pinged during testing, even when run on unleaded super at 91 octane. We've mentioned that some engineering elements trickled uphill from the K75 to the K100. The cylinders are a case in point. The four-cylinder bikes, particularly those first off the assembly line, pumped out great clouds of oil smoke upon starting after leaning on their sidestands all night. Since the K-bikes' heads sit low-side down in this position, oil inevitably seeps past the rings and into the combustion chambers; hence the smoke when starting up. While the smoking problem causes no damage, some riders, particularly those in Europe, where it is illegal even to idle a motor vehicle for long in a residential area, find it annoying. BMW engineers have strained to find a solution; in Munich and Berlin they've tried pinning the rings in position and using different ring materials, all with less than successful results. Currently, BMW uses a cylinder-finishing process to get a smoother surface and a tighter seal, and claims that with time and wear-in the problem lessens. Nonetheless, our test bike still smoked badly for the first two minutes of engine warm-up after sitting overnight on its sidestand. Not a horrible problem, but you'll want to roll your K75 or K100 out of your garage before touching its starter button. In the cylinder head proper, the fine-tuning and refinement process continues. Combustion chamber shape, naturally, adapts to fit the domed pistons. Valve angle remains at 19 degrees; valve diameter, likewise, matches K100 spec: 34mm intake, 30mm exhaust. Attempting to improve cylinder filling at high engine speeds, BMW shortened up both the intake manifolding and the exhaust pipes. K100s use a dual-stage ignition advance curve—one stage for open-throttle applications, another for partial-throttle operating. The K75 has only a single-stage curve, running roughly between the K100's two. 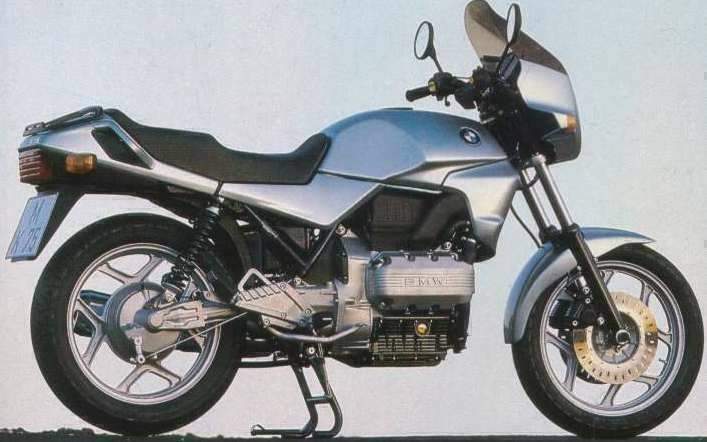 The development of BMW's camshaft arrangement on the K-bikes makes an interesting story. When the K-series first appeared, 100s bound for Europe were fitted with one cam, U.S. bikes another. By limiting the amount of valve overlap and intake time, the stateside machines made fewer emissions than the hot-rod Eurobikes—they generated less horsepower, too, with a flatter torque curve. To our mind the hot tip might have been to find some long-duration European cams to slip into the K100's top end, but just the opposite approach appealed to the torque-loving Teutons: they preferred the characteristics of the smogged engine. The result? Now all K-bikes come fitted with the short-duration cams. What do these changes in engine tuning mean? BMW claims an output of 90 horsepower per liter for the 987cc K100, but the K75's bhp/liter figures jump to 100 for a claimed output of 75 horses. Maximum rpm for the K100 machines is 8000, while the K75 intersects its horsepower peak and redline at 8500 rpm. Claimed torque peak for the 750 is 50 pounds-feet at 6750 rpm. In line with the Beemer's traditional power delivery, 83 percent of this torque is available at 2300 rpm, once again the impact of BMW's relatively mild cam timing. Five-speed transmissions are identical on both the K75 and K100s, although final-drive gearing drops on the smaller machine: the K.100 meshes 11/31 cogs together in the rear wheel's gearcase for a final reduction of 2.81:1 while the K75 uses a 3.20:1 rear end. The K100 drives through a 17-inch rear wheel and a 130/90-17 tire with a rolling circumference of 80.5 inches. While the K75C uses a larger-diameter 18-inch rear wheel, rolling circumference of the smaller 120/90-18 rear tire (Metzeler ME99As in both cases) comes out to equal the same rolling distance of 80.5 inches, so the final-drive change is significant: at 60 miles per hour the K100 spins 3572 rpm, the K75 4206. Our K75 sported Metzeler tires front and rear; BMW will also supply the bikes with Michelin, Continental or Pirelli skins as an OEM option. You'll notice further differences out at the K75's rear wheel: the 750 comes in three variations—C, S, and T. The standard C and touring T models use 18-inch rear wheels and 200mm single-leading-shoe rear drum brakes; the sport-fairing 75S will arrive fitted with the 17-inch, disc-braked rear wheel of the K100s when it appears in the U.S. this spring. As a result of its shorter engine, the 750 has less volume for liquid-cooling in its cylinder block and head. Radiator size, too, is down, and total coolant capacity is 2.65 quarts (plus 0.4 quart in the overflow tank), compared to the K100's 2.9 quarts. The short engine also necessitates a minor chassis change: the front downtubes angle back more severely to meet the K75's shorter block. In other respects, however, steel-tube space frames are identical on all the K-bikes. Suspension is not the same. At the front, new damper rods alter suspension rates, while an integral brace at the fender mount stiffens the K75's fork for sporting work. At the rear, a spring one millimeter thinner in diameter than the K100's handles the K75's lighter weight. As per standard BMW practice, neither the front nor the rear suspension offers any damping adjustments on the K75. At the rear, a familiar three-position ramp-and-detent system alters spring preload, and this is all the fine-tuning a K75 rider can perform without resorting to fork oils of differing viscosity and volume. Some upward crossover from K75 to K100 appears in the fuel department: The original K100s used two fuel warning lights—one winked on when fuel level dropped to seven litres, another when the aluminum tank hit the four-liter mark. The setup proved more annoying than informative—the seven-liter light blinked on and off on twisty roads, and always seemed to flash when two hours of riding time remained in the tank. The K75, and now the K100 as well, uses only one light which comes up at five Litres, and never flickered unnecessarily during our test. The K75's tank holds 0.3 gallon less than the liter bike's cell. Behind the gas tank, the K75 turns out to be no low-rider. A 32.5-inch seat height places the pilot just 0.3 inch lower than last year's K100 jockey, although you'll swear the 75 is lower than that when you're riding. The new seat and seatpan, while decidedly firm, suited all our riders from five-six to six-one, and this is significant: the K75 uses a sharply stepped saddle, and when such a seat is built too short it becomes a curse to tall riders. Handling is the area where the K75 really shines. BMW's 24-pound weight savings in the 750 is both noticeable and welcomed. Despite its lighter front end, the K75 feels as though it still has plenty of weight on both tires. In tight work the rear tire can slide a bit, but this is top-percentile rider territory only. Tire size, though narrow, feels about ideal for light response—more rubber on either the front or the rear might make for heavier steering, and we like the K75 right where it is. The 18-inch front wheel makes turning neither laborious nor twitchy; if you like the "traditional" handling of an 18, here it is at just about its best. Suspension is another matter. A rider can fiddle with fork oil and front-tire inflation, but these are bothersome adjustments in a time when a twirl of a knob or a puff of air through a Schrader valve routinely accomplishes miracles. The rear spring rates do feel right in the middle, with number one too soft for most, number three too stiff. Riders hammering through tight roads will find the K75 less than accommodating—the long-travel, soft-rate suspension doesn't settle down between corners, and the shock has inadequate rebound damping to harness the porpoising rear end. Crank up the spring preload to gain some ground clearance and the rebound problem worsens. Still, hot-shoe riders will want the suspension cranked up. Leaned over hard, the K75 drags its centerstand on both sides, shortly followed by the peg on the left and the underside of the brake lever's arm on the right. The center-stand is pretty solid stuff, and if you push matters it will oblige by levering the rear wheel from the road. BMWs, much of the package's appeal. Our K75C's bar was about perfect for all testers. The clutch is smooth, with a powerful, linear engagement, but, like the brakes, comes on strong in the last few degrees of throw; you'll not be speed-shifting on the Beemer. The K75 feels to have nowhere near the flywheel effect of the K100, and the K100 had nothing compared to the boxers. Still, the 750 takes off quickly from low engine speeds. The shifter is a long-travel device, but crisp, and gearbox ratios complement the engine's power curve well. Although the throttle is also a long-travel affair, fuel injection means it can use light return springs, a blessing after 150 miles of winding roads. The injection system itself was flawless on our 750, as we've come to expect. When it comes to controlling up/-down shaft reaction and driveline lash, the K75 surpasses most of its shaft-drive competition. In part this results from the 750's less than shattering horsepower. There's no pogo sensation, and the contra-rotating engine-output shaft cancels the crank's torque reaction very completely. The K75 doesn't evidence much clunk-inducing slop in its driveline either, but get on the gas hard from trailing throttle and the bike does seem to wind up its driveline before it takes off. A K75 rider, though aware of the shaft final drive, won't need to continuously choreograph his ride around the shaft reaction. The K75 merely underscores the truth: the happiest ride on a shaft-drive motorcycle is the smoothest and least lurching ride. For most aspiring K75 owners the best news comes last: the three-cylinder Beemer goes out the door for $4700, $100 more than an FZ750 Yamaha, $400 more than a GSR-X Suzuki, $1300 less than a stripped K100. A price tag well under five grand is welcome news for any cutting-edge machine, surprising for a Beemer, extraordinary for a BMW that works as well as this one does. Most other manufacturers shortchange smaller bikes derived from a larger design—they hardly ever work as well, are usually overweight and underpowered. BMW, before with the R80 and now with the K75, does just the opposite, paring and refining, powering up here, lightening, smoothing out there, to deliver to the public a machine we find more desirable than the original.